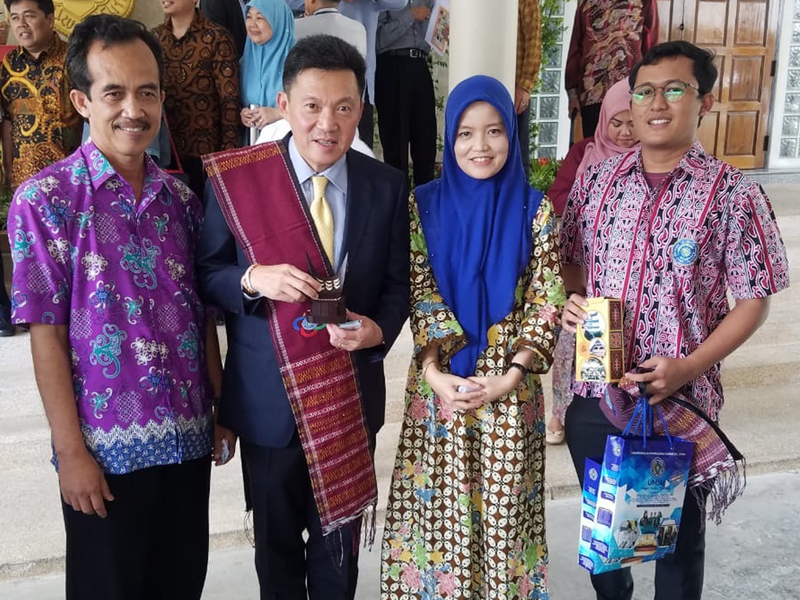 The University Muhammadiyah of Sumatra Utara again attended an international education exhibition titled “Malay Day of Yala” in Southern Thailand. The presence of UMSU in the annual activities which lasted for three days, 8 to 11 February at the invitation of the Indonesian Consulate in Songhkla. The presence of UMSU at the festival arena was welcomed by the Yala people enthusiastically. Yala residents knew UMSU enough because a number of UMSU students came from the area. They were quite interested in continuing their education at UMSU for providing scholarships. In addition, there are also many cultural similarities between Malays in Southern Thailand and Indonesia. The UMSU Chancellor, Dr. Agussani, MAP, told reporters in Medan on Sunday (2/18) that UMSU is a PTM that is always pro-active in activities in order to build international relations, starting from academics, arts-culture, sports and so on. “In addition to the exhibition, UMSU students are also actively involved in international KKN and internships. This is in line with the vision of UMSU to become a World Class University, “he said. UMSU clearly continues to strive to improve cooperation and participate in various international activities to improve academic and research quality. The international education exhibition in Thailand which was followed by UMSU itself was intended to introduce and explain in detail the information related to learning at UMSU. Given that many Thai people are very interested in continuing their studies at UMSU, therefore, UMSU opens opportunities for scholarships for ASEAN people. “UMSU will provide free tuition fees for 4 years in all existing departments, except the Faculty of Medicine,” he explained. In addition to promoting their education, in the Malay Day of Yala activity UMSU also proudly introduced and presented Traditional Malay Culture dances, namely the ‘Kuala Deli dance and the typical Batak Dance, namely the” sigale-gale “dance. “Events like this are certainly very strategic for UMSU to promote education to all ASEAN people and especially to Thai people,” he explained. Melayu Day of Yala is an integrated annual promotion activity (higher education services, cultural arts, culinary, and tourism) carried out through the collaboration of the Indonesian Consulate Songkhla with the Yala City Government. This activity aims to promote Indonesia to the people of Southern Thailand. The series of activities also enlivened the 6th Malay Day of Yala this year, such as kite competitions, parades, cultural performances (Traditional Malay dances and singing Malay songs), and educational exhibitions attended by several universities from Indonesia, Malaysia, and Thailand. Indonesia itself is represented by several PTMs. Besides UMSU, there was also the University of Yogyakarta, Muhammadiyah University of Jakarta, Muhammadiyah University of Makassar, Muhammadiyah University of Kendari, Muhammadiyah University of Prof. Dr. Hamka. While the Malaysian Universities that participated were, UUM, UTP, Unisza, and Usas. And Thailand is represented by, Rajabat University, Prince of Songkhla University (Pattani), Prince of Narathiwat University and Fatoni University. Meanwhile, Fachry Sulaiman as the Consul of the Republic of Indonesia in Songkhla revealed that he welcomed the 6th Malay Day of Yala and expressed his appreciation for the invitation from the Yala city government to Indonesia to participate in the Malay Day event. He added, the Indonesian Consulate Songkhla always supports activities that can strengthen the relationship between Indonesia and Thailand. “Through this event, it is expected that the people present can get to know more about the typical Malay culture from Indonesia, products from Indonesia and also Indonesian tourist destinations,” said Fachry.